SAN FRANCISCO — The disheveled, unshaven man pacing underneath Interstate 80 in the South of Market district is coming hard off the blindside, cackling nonsensically into the whipping wind. Greg Roman sees him at the last second, stepping off the edge of the crack-filled sidewalk as the man staggers past, then entering the glass doorway of the nondescript building. Inside, there is more mayhem: Irate customers interrogating bemused city employees who are obviously used to the drill. Roman, the San Francisco 49ers' cutting-edge offensive coordinator, has come to this impound lot to retrieve his Ford F-150 on a suddenly eventful early March afternoon. The truck, he's been told, was towed here after overstaying its welcome at a metered parking spot. Roman whips out his checkbook and shoots me a look as he prepares to deplete his family's financial portfolio by roughly $500. I give a guilty shrug — surely, I am part of the reason he's here. We both wince as a portly gentleman who does not seem to be a fan of showering enters our air space. Roman signs the check and smiles. "I took a calculated risk," he says. "Bad call. It happens. But hey, at least it's not jail." If only he could shake off every regrettable call so easily. Because his team finished five yards short of a Super Bowl championship last month, with four failed chances to get to the end zone and overcome a five-point deficit to the Baltimore Ravens, Roman is tormented by an opportunity lost. Like his favorite rock and roll band, the Rolling Stones, the 40-year-old tactician can't get no satisfaction. In his waking hours, Roman reflects on the season-defining sequence and gets irritated. When he sleeps, the anxiety becomes untenable. Inevitably, as he tosses and turns, he's reliving the moment: Third-and-goal from the 5-yard line, perfect call, play clock running down, quarterback Colin Kaepernick preparing to hit a seam that Roman's F-150 could have driven through … He's going to walk in! Then, sadistically, the dream ends, and Roman awakens with the realization that the nightmarish climax still stands: Coach Jim Harbaugh, warding off an inevitable delay-of-game penalty, calling timeout; Kaepernick throwing a pair of incompletions to Michael Crabtree that doomed the Niners to a 34-31 defeat and sentenced their ambitious play-caller to an offseason of second-guessing. The upshot is especially cruel: Roman, the man who probably dialed up more brilliant calls than anyone in the business last season, the audacious innovator who overhauled the Niners' offense on the fly in midseason and literally and figuratively unveiled formations that turned the football world upside down, is the guy getting blasted by half the folks who've ever held a Madden joystick. It's also likely that Roman, counterintuitive as it may sound, was denied the opportunity to become an NFL head coach by virtue of San Francisco's postseason success. "The only reason Greg hasn't gotten one of those jobs yet? Timing," says Jacksonville Jaguars general manager Dave Caldwell. Timing, it seems, is everything: Meet a writer for a late lunch, get engrossed in conversation and end up taking an impromptu trip to the impound lot. "It's tough," Roman says as we're led into a gated lot bordered by barbwire, his vehicle one of hundreds waiting to be claimed. "I hate that [the Super Bowl] ended that way. But we'll turn it into a positive. It'll be the spawn of something great." If Harbaugh is the high-strung, hyper-competitive face of the 49ers, Roman is the franchise's relentlessly unrestrained inner monologue. The second-year head coach and the offensive coordinator who followed him to San Francisco from Stanford have much in common. Neither lacks confidence, favors subtlety nor is particularly beholden to convention. "You can never say Jim and I aren't open-minded," Roman says. "At Stanford, we went the opposite of everybody. Now we're moving in our own direction. We're taking it as far as it can go, doing things like putting eight offensive linemen on the field. In a way, it's simple: You've gotta see what you've got, and put people in positions of strength." Many coaches preach this philosophy, but Roman lives it: In 2009 Stanford's high-scoring attack revolved around the power running of Heisman Trophy runner-up Toby Gerhart. The next year, with Gerhart gone, he opened up the Cardinal's aerial attack to take advantage of quarterback Andrew Luck's arm. 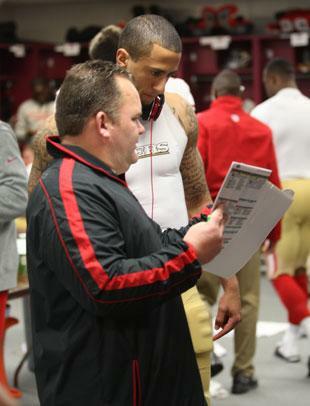 When Roman came to the Niners in 2011, the lockout deprived him of a chance to teach his scheme to incumbent quarterback Alex Smith over the offseason. Smith nonetheless thrived in a scaled-back system that played to his strengths, reviving his career and coming up huge in the Niners' epic 39-38 playoff victory over the New Orleans Saints, when Roman shrewdly opened up the offense. Smith, the NFL's third-rated passer at the time, suffered a concussion in a game last November against the St. Louis Rams, forcing him to sit out the following week. He never got his job back, as Kaepernick's revelatory performance in a Monday night triumph over the Chicago Bears spurred Harbaugh to make a change. Roman took that edict and ran with it, taking advantage of the second-year quarterback's athleticism and versatility by employing an aggressive attack that incorporated elements of the read-option. Already attracting interest as a potential head-coaching candidate, Roman raised his profile each time Kaepernick busted off a big run out of the "Pistol" formation, Frank Gore blasted through the line out of the "inverted wishbone" (featuring two tight ends and a back wrapped around the quarterback) and the Niners took down another tough opponent. "It's amazing what Greg has done," Harbaugh says. "He's basically revolutionized offense as we know it." Joe Staley, the 49ers' Pro Bowl left tackle, elaborates: "I've never been around a coordinator who understands everything. Not just X's and O's and how you draw it up, but the bigger picture, too. Watching games [on tape], I find myself saying, 'This is a perfect call here.' It seems seamless to him. There are a lot of guys who are really smart with plays and who run creative schemes, but it's the way you call those plays that makes all the difference. He's great at both. He's very innovative." And yet, as the second-seeded Niners sat out the first week of the playoffs, none of the teams seeking head coaches reached out to schedule a meeting with Roman. As per league rules, that bye week was the last time he'd be available to be interviewed until after the Niners' season ended. Heading into their Jan. 12 divisional-round matchup against the Packers, Roman became resigned to the fact that beating Green Bay would likely do damage to his career aspirations. "Some people I know that are pretty savvy in the business pretty much told me, 'If you win this game, you're [expletive] out of luck,' " Roman says. "It's a little bit of irony — the more you win, the less chance you have of getting those jobs. I was talking on the phone with my agent, Dave Dunn, and he told me that, and I said, 'So wait a second — you're telling me that if we win, I lose?' "
The Niners didn't just win; they embarrassed the Packers, shaking off an early interception return for touchdown to roll to a 45-31 victory. Facing off against one of his mentors, Green Bay defensive coordinator Dom Capers, Roman showcased the read option in all its dynamic splendor. Kaepernick threw for 263 yards and two touchdowns; he also ran for two more scores and 181 yards, the highest single-game rushing total for a quarterback in NFL history. San Francisco gained a franchise-postseason-record 579 total yards. It was like a three-hour campaign ad for Roman's head-coaching candidacy. "Dom is like a godfather to me," Roman says of Capers, who employed him during head-coaching stints with the Carolina Panthers and Houston Texans. "I respect that guy so much. He's not happy with me right now. What are you gonna do?" As the Niners continued through the postseason, Roman watched the head-coaching jobs disappear. Four days after that victory over the Packers, as the Niners prepared for an NFC championship game showdown with the Atlanta Falcons, Chip Kelly and Marc Trestman were hired by the Philadelphia Eagles and Chicago Bears, respectively. Seven of the eight franchises conducting searches had settled on coaches regarded as offensive gurus, and yet the guy coming up with the most groundbreaking game plans of all was not among them. The last team on the clock, the Jaguars, seemed intent on waiting for Roman. 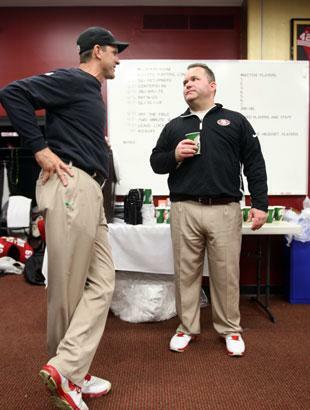 After all Caldwell, who hadn't been hired as the team's general manager until after the Niners' bye week, was Roman's former college teammate at John Carroll University. The two men had later shared a Charlotte apartment as young Panthers employees, but this went beyond familiarity. From afar Caldwell, who'd been a highly regarded personnel executive with the Atlanta Falcons and Indianapolis Colts, had been extremely impressed by Roman's skill set. "As a head coaching candidate, he has a lot of things that are intriguing," Caldwell says. "He's worked on offense and defense, and even strength and conditioning. In San Francisco he's had great success with two very different quarterbacks. He's dealt with a lot of adversity. He's definitely stayed ahead of the curve. I think the biggest thing is that he puts his players in a very good position to succeed." Caldwell, however, didn't wait: Three days before the NFC championship game he hired Gus Bradley, the former defensive coordinator for the Seattle Seahawks, who'd been eliminated from the playoffs by the Falcons the previous Sunday. Not only was Caldwell sold on Bradley, but the GM also was put off by the possibility of having to put the search on hold until after the Super Bowl to talk to Roman, as he felt such a delay would set back the rebuilding franchise. So, Roman waits. And his current team rejoices. "He's the best coordinator I've ever had," says running back Frank Gore, the Niners' all-time franchise rushing leader. "I respect Norv Turner and Mike Martz, but G-Ro is a very smart guy. He made the game so easy for everybody — for me, for our line, for our quarterback. I want him to be with me forever, but I want him to be a head coach. He deserves it. He'll be a great one. I feel that if everything goes right, this'll be his last year with us." Adds 49ers running backs coach Tom Rathman: "I was surprised he didn't get a job this year, because I think he has everything. Not only does he have the X's and O's down, but he motivates his players. He's a real leader. Players love him. He fits the mold of some really good coaches. We were really lucky we got him back again next year. When he gets a shot, I think he's gonna open a lot of eyes." Long before his current colleagues could conjure visions of a Roman Empire, the Jersey Shore native was showing his initiative in the shadow of the Boardwalk Empire. Growing up in Atlantic City, Roman spent his summers shuttling ice-cream containers to beachside vendors, probably making less in July and August than the price of prying one's F-150 from a San Francisco impound lot. Roman, the youngest of three boys raised by a single mother, was already volunteering with the Special Olympics by the time he was eight. His older brother, Matthew, has Down's Syndrome, and their close relationship has clearly impacted him on both personal and professional levels. "That's my buddy," Roman says of Matthew. "He's a huge part of my life." When Roman played at John Carroll, a Division III school near Cleveland, Matthew was a frequent visitor. He'd hang out, go to parties and pretty much get treated like the coolest kid at school. The guy has plenty of personality: Once, after being introduced to Panthers owner Jerry Richardson when Greg was a low-level member of Carolina's coaching staff, Matthew said, "You're Greg's boss? You need to pay him more." Greg, while at John Carroll, established Project H.O.P.E., a program that brought developmentally disabled kids onto campus to participate in a variety of sports. Says Roman of the event, which still occurs annually at the school: "It was the first time I took the reins over something and brought it up from the ground floor." On the football field, Roman was far less altruistic. A 5-foot-8 nose guard, Roman made up for his lack of size with a disproportionate share of attitude. "On the field he was nasty," Caldwell recalls. "He was competitive. He was our team leader. He self-proclaimed our defensive line the 'Legion of Doom.' The younger guys were probably more intimidated by him than anything. But people gravitated toward him because he was easy to talk to." In 1995 Roman hooked on with the expansion Panthers, serving as an unpaid assistant strength and conditioning coach. He segued into a simultaneous gig as Capers' defensive quality control coach, later switching over to a similar role on the offensive side. "He came in and was an energetic young guy, anxious to learn as much as he could," Capers recalls. "Greg's a loyal guy, a hard worker and has a very good mind. It's a good combination. He's earned everything that he's gotten." Recalls Caldwell, who rented a room from Roman after coming to the Panthers as a scouting assistant in '96: "I remember I'd come home, it'd be May or June, and Greg would be in the kitchen, diagramming plays and studying the playbook. It was our off time. I was like, 'What are you doing?' "
Capers was fired following the '98 season and replaced by George Seifert, who'd coached the Niners to a pair of Super Bowl victories. Seifert kept Roman on as an offensive assistant assigned to the team's tight ends — and began noticing similarities to another highly motivated young staffer who'd started off in San Francisco handling player ticket requests for road games. "He kind of reminded me of [Jon] Gruden," Seifert recalls. "Gruden would always sit and watch [veteran offensive line coach] Bobb McKittrick's meetings and delve into all aspects of the game. Basically, Greg was the same kind of guy. It wasn't like he was just gonna work with the tight ends. He was gonna know every facet of the offense. He knew it, in some ways, better than some of the coaches on the staff. "He asked a lot of questions. He was very specific and he was a sponge. He wanted to know everything. He was bright. He had a smirk. He could tell a joke, and if it didn't go over, he could take the abuse." Roman's strong sense of self served him well in subsequent stints with the Texans (where he coached tight ends and quarterbacks from 2002-05) and Ravens (where he was an assistant offensive line coach from 2006-07). When he arrived in San Francisco with Harbaugh, he remembered his roots, making the team's position coaches feel invested in the product and creating an inclusive environment. Roman not only delegates game-planning responsibilities to Rathman, quarterbacks coach Geep Chryst, offensive line coach Mike Solari and receivers coach John Morton, but he also solicits their play-calling suggestions in the heat of battle. "We sit in the room and he'll put his thoughts up on the board and ask what we think, and we'll collectively discuss things," Rathman says of Roman. "It's not just him. He's looking for input from all the coaches he works with. And he listens." Says Roman: "I've been in that position — the frustrated assistant who wants to voice his opinion. It's frustrating. I used to throw out insane stuff, just to get people going." Roman may not be a dictator, but he has no problem dictating to opposing defenses. "He knows how to take that defense apart," Rathman says. "He breaks 'em down. He definitely has [swagger]. He's got a lot of confidence. But he should have a lot of confidence." "I'm a riveter in the morning and a poet at night," Roman says, twirling some cellophane noodles with Dungeness crab on his fork. He is sitting at a bayside table at the Slanted Door, a trendy Vietnamese restaurant, with a crystal-clear view of Alcatraz Island. While providing insight into the way he crafts and executes a game plan — a lengthy explanation that will ultimately lead us to the impound lot — Roman manages to make a brutally violent sport with 22 simultaneous moving parts seem suspiciously like a chess match. "Play-calling, it's week to week, but sometimes it goes beyond that, too," Roman says. "I don't want to sound too melodramatic. But here's what it is: I orchestrate sequences of events. I don't just grab plays. Everything I do has a purpose. I'm thinking big picture." And as Roman suggests, many of those thoughts come at odd hours. "A lot of my [expletive] happens at night — late at night," he says. "I'm nocturnal. I'll be in bed, asleep, and I'll get up and walk into the other room and start writing things down. It's hard to turn it off." To turn it back on the next day, Roman employs a strategy familiar to many working Americans. "He drinks a lot of coffee in the morning," Staley says. "He's like a mad scientist in his room, scheming up plays. He comes down to our install meetings on Wednesdays just pouring sweat. He looks like a nervous high school student. We ask him, 'Are you all right? You just sweat profusely.' I'm in the front row, too. There are times when he's dripping sweat on the overhead projector." The plays Roman unveils on the screen, of course, are far more aesthetically pleasing. "He's a genius when it comes to football," Staley says. "He comes up with crazy stuff you don't see anywhere else — and he calls it at the perfect time." Except, of course, when he intentionally doesn't. In mid-December, after the Niners pulled out a 41-34 victory over the New England Patriots to improve to 10-3-1, Roman consciously decided to dial back the offense in order to keep potential playoff opponents off balance. That approach seemed dubious the following Sunday night in Seattle, when the 49ers absorbed a 42-13 thrashing at the hands of the Seahawks, but Roman took solace in the fight Kaepernick displayed in leading San Francisco to a late touchdown. The next week, though Roman kept things relatively conservative, the 49ers defeated the Arizona Cardinals to clinch the NFC West title and a first-round bye. Two weeks later against the Packers, Roman unleashed the fury. "My post-New England mindset was to hold back and try to save things for the playoffs," Roman says. "We did a bunch of [read-option plays] against New England, but you run into that question of exposure. The reality is that you've got to win playoff games. That was definitely part of the plan. Because NFL teams are too good — you start showing something and having success, they're gonna find a way to stop it. "You don't want to make a living on it. If you can win a game and hold that back, why not? I coached defense. I know what it's like when you have to prepare for something like that. It's all hands on deck. It's mayhem." The Niners faced some chaos of their own in each of their final two games of 2012. Against the Falcons in the NFC championship game, they trailed 17-0 before rallying to win 28-24. In the Super Bowl, the Ravens took a 28-6 lead early in the second half before the lights went out in the Superdome and the light went on for San Francisco's offense. In both crises, Roman kept his cool. "We're down in the NFC championship game, and he stays calm and sticks to his game plan, and we launch that comeback," Gore recalls. "In the Super Bowl, same thing: We don't panic. When we started clicking, the [Ravens'] defense, they didn't have a clue." And then, seven yards from a potential go-ahead touchdown, the Niners' offense mysteriously stalled. In the weeks since, Roman has been questioned by armchair coordinators for everything from not calling more running plays to not staying exclusively with the read option to trying to force the ball to Crabtree at the expense of other targets. If it makes them feel any better, he has broken it down thousands of times in his mind — and, of course, in his sleep. Roman knows what he called, and knows how close he was to riding in a parade down Market Street while being lauded by the same people as the second coming of Bill Walsh. And now, as he stands on Bryant Street underneath a raised portion of the interstate, preparing to reclaim his ride, the riveter/poet is being asked to relive the maddening sequence yet again. First-and-goal from the 7, 2:39 remaining: Gore, who'd just busted off a 33-yard run, was on the sidelines as backup running back LaMichael James lined up behind Kaepernick in a full-house Pistol formation. James took a handoff and slipped through a hole to his immediate right; Ravens linebacker Dannell Ellerbee plugged the gap and nailed him after a two-yard gain. In retrospect, Roman's cool with his decision — a little more room and James could have made a cut and cruised into the end zone. Second-and-goal from the 5, following the two-minute warning: Kaepernick, lined up in the shotgun, rolled right and threw short and off target to Crabtree, who'd been bumped by cornerback Corey Graham. Many observers later wondered whether Kaepernick should have instead tried to thread a high pass over the middle to Randy Moss, who appeared to be open on the play. In the Niners' coaching box, they were yelling for a pass interference call on Graham. Third-and-goal from the 5, 1:55 remaining: This one was the killer. Kaepernick lined up in the Pistol, with Gore to his immediate right. It was a read-option play, in theory, but it essentially was a quarterback counter. Kaepernick, after a step backward, was going to run behind right guard Alex Boone and Gore, each of whom was pulling left. Roman was sure the quarterback was going to score. He was sure the Ravens' coaches were sure a touchdown was imminent. Yet with the play clock nearing zero, Harbaugh called timeout. Chalk it up to the downside of having turned over an offense to a tantalizingly talented but inexperienced quarterback in November. Harbaugh and Roman took a calculated risk, and it was a split-second away from paying off. At that point, with the Ravens' coaches having just watched their season flash before their eyes, Roman was convinced of one thing: There's no way Baltimore would stay passive. Sure enough, two "Cover 0" blitzes were coming. And Roman, playing the percentages, dialed up plays that called for Crabtree — Kaepernick's favorite target — to be the "hot" receiver. "Wouldn't you rather give your guys a chance to make a play?" Roman asks rhetorically. Third-and-goal, Part II: Kaepernick lined up under center, took a conventional snap, dropped back and made a quick pass to Crabtree, who had gone in motion to the right and cut hard to the sideline. Cornerback Jimmy Smith got there quickly and dislodged the ball from the receiver's hand, setting up the final play. Fourth-and-goal from the 5, 1:50 remaining: Kaepernick, from the Pistol, had little time to throw as Ellerbee came in hard and unblocked on the blitz. Crabtree and Smith did some back-and-forth pushing before Kaepernick threw for the receiver and the ball fell incomplete. On the sideline, Harbaugh went crazy, gesturing for defensive holding. No call. No Super Bowl triumph. No satisfaction. Suffice it to say that Roman is highly motivated to end next season under a stream of red-and-gold confetti — ideally, with another franchise waiting impatiently to hire him as its head coach. Surely, that inconvenient timing issue could hamstring him the way it did this past season, though the buzz about Roman in league circles will likely be louder in 2013. Says Caldwell: "I would envision him being one of the top (head-coaching candidates), with his track record of success, his experiences both at the college and pro level, and his offensive IQ and his defensive IQ." Conveniently, the Niners remain loaded, with the prospect for improvement, having added to their already large pool of draft picks by trading Smith to the Kansas City Chiefs. And Roman has a new toy in ex-Ravens wideout Anquan Boldin, stolen for a sixth-round selection earlier this month. On paper, the 49ers look like preseason Super Bowl favorites. Yet, as Roman knows all too well, nothing is promised in the NFL. For one thing, Capers and his fellow defensive coordinators will devote much of their offseason to devising ways to combat the read option. "Oh yeah, they're gonna find ways to stop it," Roman says as he gets behind the wheel of his truck and prepares to head south into rush-hour traffic, with a stop to pick up some Febreze on his immediate agenda. "It's gonna go back and forth. And we've gotta predict what they will do and figure out how to counter that. "But the reality is, if you've got a guy who can throw the ball like [Kaepernick] can and run it like he can, it eventually becomes a numbers game. What do you want to stop? Then we turn to something we call play-action, and it's a huge advantage. "So yeah, they're gonna be spending a lot of time on this. They should. This is real. And we're just getting started."